Water issues affecting a sloped garden are easily overlooked until heavy rain starts falling and our slopes start dancing the electric slide down the hill. Bottom line: Land erosion can be a menace to your landscape. Even if you don’t currently see mudslides and swamps in your outdoor space, it doesn’t mean the process isn’t looming. The truth is that soil naturally wears away like the soles of shoes, but we also inadvertently speed up the process when we over-dig hillsides, improperly water plants and lawns, and compact the soil. Luckily there are ways to prevent and control erosion and sometimes it takes more than one method. The most common safeguard for this issue is strategic planting. Certain plants are superior at controlling and preventing erosion. As roots become established, they anchor the soil and drink up excess water. Seek out plants that like to creep and cascade so that less soil is disturbed; these plants will naturally blanket the ground. Use natives accustomed to unglamorous soil and brutal rocky slopes. Because bare soil is more susceptible to rain- and wind-induced erosion, it is smart (and more attractive) to keep your soil covered with these plants year-round. Another erosion control tactic is to build small retaining walls or terraces. With tiers of flat surfaces, the levels can be planted and the water will soak in instead of wastefully running off. 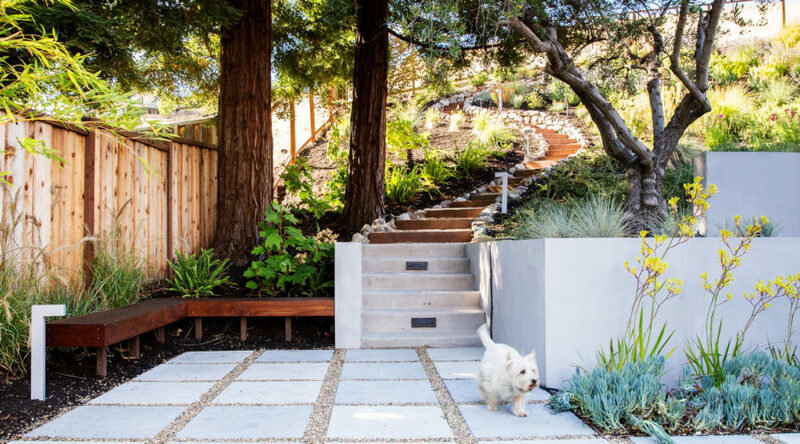 Though these solutions can be more expensive, the results are long-lasting with the added benefit of gifting a garden landscape with more depth and dimension. Mulch is another erosion solution if the slope isn’t overwhelmingly steep. Applying a 2-3 inch layer of a heavy, chunky mulch helps stabilize the soil. (Tip: Avoid using small bark that will easily wash away.) Mulch has many other benefits to the soil, such as helping regulate its temperature, bestowing it with organic matter, and increasing its moisture retention. An erosion control method gaining in popularity is an underground drainage system called a French drain that redirects and captures destructive runoff by incorporating gravel, heavy-duty landscape fabric, and perforated pipe. French drains are both functional and easily concealed. Finally, a rain garden or rainwater collection barrels can help keep erosion at bay. Rainwater dripping from rooftops can be a main contender in the erosion battle. Rain gardens can perform as a good drainage helper while also being attractive and keeping nasty chemicals and materials from running into ocean-bound storm drains.